Golden Eagle (Auquila schysaetos): Golden eagles are very agile and can fly quickly (up to 241km/hr. ), with its powerful wings and talons; the wingspan of this animal is 1.8-2.3 meters wide. These animals can weigh from 3-7 kilograms, and have an average lifespan of 18 years. The Golden eagle is a carnivorous hunter, and its main prey in the Gobi is the jerboa, although they will eat any other animal it is able to find in the Gobi. With its sharp claws and large size (when comparing to other types of eagles) it is not hard for this animal to find food in the desert. As well, the female golden eagles are considerably larger than the males, which may be so that the female is able to better protect their young. The Golden eagle can live almost any area of the Gobi, as they are adapted to the cold weather in the Tian Shan range of the Gobi to the slightly warmer weather of the desert steppe. Snow Leopard (Panthera uncia): These animals are distributed throughout Central Asia, and are in the mountain ranges of the Gobi desert such as the Tian Shan range. This animal is a powerful predator, and can take down large animals easily, such as the ibex, which is one of its main food sources. Male leopards can reach a length of 1.3 meters and 57 kg. The female leopards are relatively smaller. Some behavioural adaptations include eating farmer's livestock in the winter if unable to find enough food, as well as hunting travelling so quietly that studying the animal in its natural habitat is a difficulty. It has a thick coat of fur to keep warm at high elevations; this animal can live at elevations as high as 5500 meters. These animals are endangered and there could be as few as 500 left in the Gobi and Mongolian region. 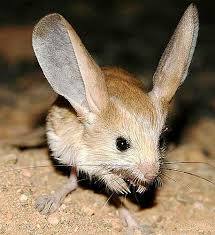 Jerboa (Allactaga bullata): There are 11 different species of jerboa in the Gobi desert, mainly in Eastern Gobi Desert Steppe, the Tian Shan Range, and the Junggar Basin of the Gobi. Similar to kangaroos, they have powerful hind legs, and are able to jump up to 10 feet, which helps them escape predators, and their long tail helps keep their balance when hopping on rocky areas. The tails are on average between 12.8 to 25 cm. Jerboas always walk on their hind legs, as opposing to all fours, as their hind legs are about four times bigger than their front ones. They feed on seeds, tubers, roots, insects, and larvae. As well, have excellent hearing, which helps them get away from predators, such as the Golden Eagle. Gobi Bear (Ursus arctos): These animals are only found in the Gobi desert (unlike the Golden eagles) are only in small populations; only about 50 are left, but some feeding programs and protected areas are helping to increase those numbers, and keep them from extinction. These bears are considered a subspecies of brown bears, but have longer limbs and shorter fur. The Gobi bear is an omnivore, eating the leaves and roots of wild rhubarb and other plants in addition to lizards and insects. They are considered scavengers as they rarely kill their own prey. The endangerment is mostly due to human expansion, as well as the change in the climate and environment in the Gobi. Many people kill these bears for taking their livestock as the bears have to either try to adapt to close proximity with humans or move to other areas. The rapid change in environment is also harming the Gobi bear’s chance of survival; in past centuries, the vegetation in the Gobi was more varied and less harsh, whereas now many species in the Gobi are considered endangered, or at least threatened. In terms of behaviour, these bears are very shy and hard to find. Bactrian Camel (Camelus bactrianus): This type of camel is one of the last wild breed of camels, and there are less than 1000 left in the Gobi desert. 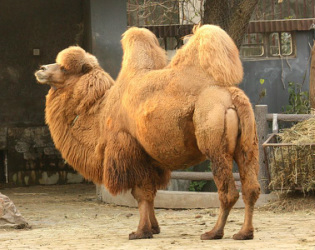 Some structural adaptations of this animal include the two humps of fat on the camel's back which it can convert to water, its long eyelashes which help to keep sand out of its eyes and its ability to close its nostrils in order keep its nasal passages clear of sand during sandstorms. As well, the camel barely sweats to keep water in its body and has a thick winter coat to keep from the cold, which it sheds in the summer. These camels migrate, and their habitats can include: rocky mountains, flat desert, sand dunes, and stony plains. They grow to reach the height of 2 meters, and have a lifespan of approximately 50 years.